The Los Angeles Eco-Village (LAEV) neighborhood is located in the north end of Wilshire Center/Koreatown and in East Hollywood in the city of Los Angeles. Our 30 to 40 member intentional community living in the LAEV two block neighborhood demonstrates processes for achieving lower environmental impacts while raising the quality of community life. We envision changing the way we live in the city and strive to inspire others to make more rapid and deeper changes in their living patterns, as well. These LAEV processes began in 1993. This is our virtual home and a gateway to our family of organizations working toward ever greater manifestation of the LAEV vision. Eco-Village Intentional Community members demonstrate the processes for creating a healthy neighborhood ecologically, socially and economically. The strategy is to reduce environmental impacts while raising the quality of neighborhood life. The LA Eco-Village is a demonstration of sustainable community development. We share our processes, strategies and techniques with others through tours, talks, workshops, conferences, public advocacy and the media. We are located three miles west of downtown L.A. on Bimini and White House Place, one block east of one of Los Angeles most auto congested traffic corridors, Vermont Avenue. We live and work in a two block neighborhood. LAEV is in a special planning district of the City known as the East Hollywood Targeted Neighborhood Initiative or the Station Neighborhood Area Plan (SNAP). Link to google maps. LAEV leadership had a long and productive relationship with the City’s Wilshire Center/Koreatown Redevelopment Area prior to that Agency’s discontinuance in 2012. The Cooperative Resources and Services Project (CRSP), the initial developer of the LAEV plan acquired two apartment buildings in the 1990s, and a third building in 2011 with the Beverly-Vermont Community Land Trust, bringing 50 units of neighborhood housing under community control. CRSP’S Ecological Revolving Loan Fund (ELF), a community development loan fund, is the source of funds for these acquisitions. ELF monies are also being used for basic rehabilitation and ecological retrofitting of the buildings. A resident organized limited equity housing cooperative, Urban Soil-Tierra Urbana (USTU), acquired two of the buildings from CRSP in 2012. The land underneath the buildings was donated by CRSP to the Beverly-Vermont Community Land Trust (BVCLT) in 2012 as well. Together, these three nonprofit organizations, whose members form the LAEV Intentional Community, provide on-going development of the LAEV neighborhood. In each case, the buildings and land have been removed from the speculative real estate market and will continue to provide permanently affordable housing for low to moderate income households. Rental cash flow from the buildings is sufficient to maintain the properties and provide for on-going environmentally sensitive retrofitting. Overall demographics of the neighborhood include approximately 15 ethnic groups. Incomes are very low to middle but primarily lower. A diversity of households includes singles, couples, single parents, nuclear families, room mates, and extended families. Ages range from infancy to the elderly. There are approximately 500 persons living in the two block area, of which approximately 75 participate in some aspect of LAEV activities. At this time, there are still many residents in the two block neighborhood who may not be aware that they live in the Los Angeles Eco-Village neighborhood. Approximately 30 to 40 neighbors from diverse backgrounds and income levels have moved to the neighborhood intentionally to learn, share their knowledge and to demonstrate LAEV processes. 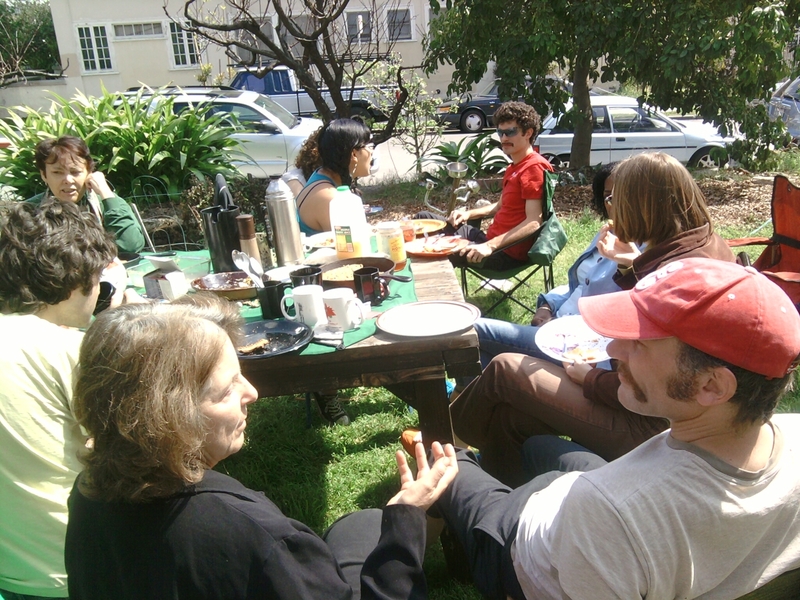 Many attend regular community potluck dinners, community meetings, workshops on permaculture approaches to sustainable urban living, community work parties, and provide a variety of public services to the neighborhood and the city at large on a broad range of sustainability areas. Most Eco-Village Intentional Community members do not own private cars. Households which do not own cars receive a $25 per month discount on their rent. Several Eco-Village members have started small green businesses, which CRSP has helped incubate over the years. While approximately 30 to 40 neighbors moved to LAEV intentionally, we share our buildings and the neighborhood with many other neighbors. These core values were established at an LAEV retreat on values clarification in March 2001 and have been re-visited from time to time at retreats over the years. 2. Take responsibility for each other & the planet through local environmental & social action. CRSP, a nonprofit 501.c.3 community development organization founded in 1980, was the founding developer and sponsor of the LAEV . However, during the past decade many LAEV intentional community members have contributed major energy and commitment to the LAEV Demonstration, resulting in an accelerating manifestation of the LAEV vision and purpose, especially through the USTU Housing Co-op and the Beverly-Vermont Community Land Trust, along with many individual and other collaborative initiatives in the LAEV. CRSP continues to be a resource center for small ecological cooperative communities. It is located in the LA Eco-Village neighborhood.